We are finally one full arc through the new era of Renew Your Vows. 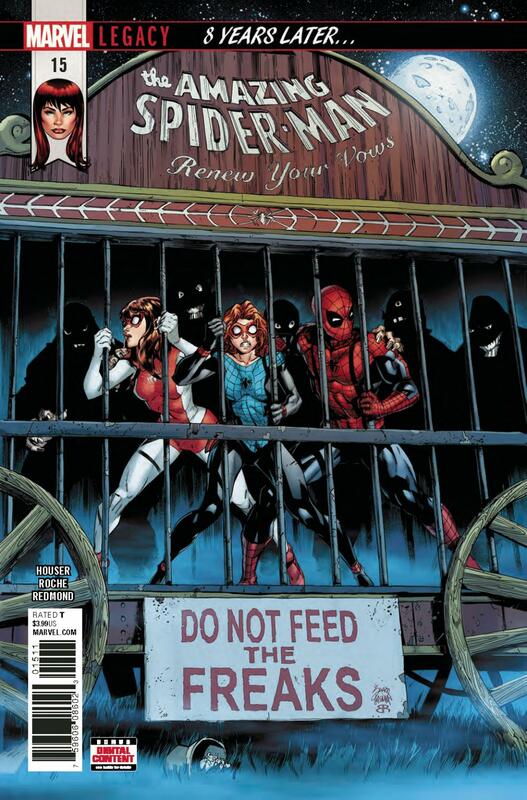 If it wasn't after issue #13, then this is where many will be making that final call to stay on board or jump ship. I’m on board. 8 Years Later has been just what I needed it to be: a lighthearted, reassuring, fun Spider-Family adventure. The solicitations say otherwise, but I'm marking the Parker Family Fun Day a success. Spoilers below. Artist Nick Roche is still on top of his game, delivering great backgrounds, action sequences with strong dynamics, sympathetic expressions, etc. His Lizard is a highlight for me. He’s slimy, scaly, scary one moment, and giving them puppy dog eyes the next. Mister Sinister looks great as well. His…ribbon things flow in the wind to give him dramatic flair, and the rest of him is noticeably clean. It’s a great surprise splash page. Colorist Ruth Redmond is crucial in making environments believable by using the shadows against everyone involved. The two make for an occasionally animated look that’s restrained and doesn’t go over the top.